Head to Mary River National Park, NT, to avoid the crowds of Kakadu. The sunset cruise with Wetland Cruises on Corroboree Billabong provides magnificent scenery and birdlife. All of us know about Kakadu National Park; its reputation for superb rock art, stupendous escarpments and breathtaking wetlands is well deserved. Many who approach Kakadu from Darwin speed past signs pointing the way to Corroboree Billabong, Mary River and Point Stuart without so much as a curious glance, and without realising how much they are missing. So let us introduce you to this remarkable area, but only if you promise to not tell anyone else about it so it does not become as crowded as Kakadu can be. It is all about the Mary River here, with a sprawling catchment that embraces lily-studded wetlands, billabongs throbbing with wading birds and crocodiles, monsoon and paperbark forests laced with parrots and fruit bats, and a chance to just relax and have a great Top End experience. RV birders will have already stopped along the Arnhem Highway from west to east at such fabulous spots as Fogg Dam, Windows on the Wetlands and maybe even Leaning Tree Lagoon. 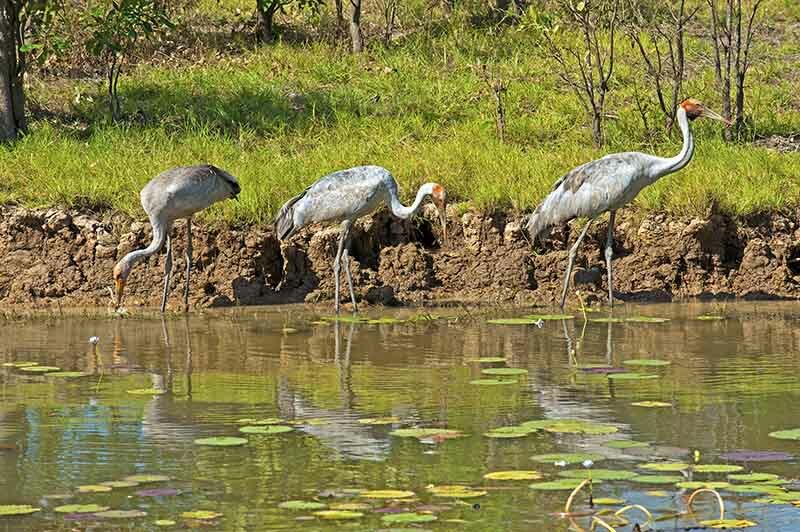 Two adult brolgas and a juvenile forage/fish along the banks of Corroboree Billabong. To visit this region and not do a wetlands cruise amounts to a tragedy, and you couldn’t possibly do better than the one at Corroboree Billabong. Corroboree Park Tavern has camping at the back and the access road to the billabong is 200m along; turn north and drive for 20km to the billabong (the last 10km are unsealed). The Wetland Cruise’s late afternoon trip offers the most birdlife but, honestly, anytime is heaven on Corroboree Billabong. Be especially alert for wallabies on the road, and watch for them gathering to feed in the field to the south-west of the billabong. The next place offering camping is Mary River Wilderness Retreat (formerly Mary River Park), an absolute gem of a place and an excellent base camp for the entire region. Don’t expect a flash toilet block or laundry facility, but the setting well and truly makes up for that. To set off for a day of exploring (try the drive to Bird Billabong with a 4.5km walk to the lookout), and to then return to Mary River Retreat for a swim in the pool before beer o’clock, is a delight. River cruises are on offer and are okay, but if the budget only allows for one, pick the billabong cruise. Kingfishers, black cockatoos and numerous other birds can be seen in the park; at dawn the misty field is populated by agile wallabies. A large estuarine crocodile warms itself in the sun on the banks of Corroboree Billabong. Don’t even think about swimming in or fishing from the shore of the river; the Mary has the highest concentration of estuarine crocs in the world. The bridge over the Mary River is a good place to spot one, although the billabong cruise will have already introduced you to a dozen or so (depending on the time of year). Next up for a roadhouse campground is Bark Hut, though currently (dry season 2017) it is closed. Access to Annaburro Billabong is across the road and also may or may not be open, so check the signage. Point Stuart Road is 18km further on the Arnhem Highway and this is the main road with access to Mary River National Park. If you haven’t already set-up camp, there are three options. Couzens Campground is at the end of 18km-long Rockhole Road and is perfect for those wanting a secluded bush camp. Point Stuart Wilderness Lodge is 40km north of the turn-off and offers such creature comforts as showers, a swimming pool and a saloon. The lodge offers boat hire from Shady Camp and a wetland cruise from Rockhole. Shady Camp, 17km on, has camping but no shade and seems to be popular with RVers who want to set-up for weeks at a time and go fishing until they can’t stand the thought of one more barbecued barramundi and/or they run out of water. So, what is there to see in Mary River National Park proper? Rockhole Road is worth a drive with access to the northern end of Hardies 4WD Track and the southern end of the Wildman 4WD Track. Have a look at Couzens Lookout; nearby is the site of the Mary River Wetlands Cruise on Rockhole Billabong (run by Point Stuart Lodge). If you loved the Corroboree Billabong cruise or didn’t get the chance to take one, don’t miss this. Mary River Wilderness Retreat (formerly Mary River Park) makes a great base from which to explore the Mary River region. The next unsealed road cutting into the park is Wildman; shortly past the turn-off is the 2km Brian Creek Monsoon Forest Walk with a picnic table at the start. Not surprisingly, Wildman Road gives access to Wildman Track; at the end of the road is an airstrip and the Wildman Wilderness Lodge. North of the Wildman Road turn-off is Mistake Billabong with a viewing platform and picnic table. Point Stuart Wilderness Lodge is worth a stop even if you aren’t camping there; the 1.6km Jimmy Creek Monsoon Forest Walk is lovely. Shady Camp is at the end of 16km Shady Camp Road; take extra care of wallabies and be sure to visit the lookout. Flocks of corellas brighten the blue sky with their cries and aerobatics. Boats can be hired but fishermen should be aware that the area is tidal and you can be left high and dry in the middle of a mud bank. The historically inclined bushwalking four-wheel-driver, equipped with full emergency supplies in case of a breakdown, may want to follow in the tracks of John McDouall Stuart through the Stuart Coastal Reserve to a 5km return walk via Stuart’s Memorial Cairn. Download the information sheet from the NT Parks website and follow all the precautions for this 57km return drive along a remote track. We could say that Mary River is the quiet alternative to Kakadu, but that would imply you should choose one over the other. The truth is, they are both wonderful and it would be a shame to be touring in the Top End area and not explore the Mary River, west of Kakadu. Point Stuart Road is sealed to within 7km of Point Stuart Lodge. The rest of Point Stuart Road, Shady Camp Road and 10kms of Corroboree Access Road are unsealed with corrugations and dust; suitable for 4WDs, AWDs, SUVs and sturdy vans. Rockhole Road is a rough, unsealed road suitable for 4WDs, AWDs, SUVs and small offroad vans. Wildman Road is also unsealed; it provides access to 4WD Wildman Track and Wildman Wilderness Lodge. The Wildman Track, Hardies Track and Point Stuart Road north of the Shady Camp Road turn-off are all rough, 4WD-only tracks, no towing. Early May through October, depending on wet season and conditions. All food and water as the last food store is in Humpty Doo. Fuel, meals and limited supplies are available at the Cooroboree Park Tavern (Bark Hut Inn is currently closed). Meals are available at Mary River Wilderness Retreat, Wildman Wilderness Lodge and Point Stuart Wilderness Lodge. Cooroboree Park Tavern: Roadhouse, meals, camping, and the nearest to Corroboree Billabong cruise and boat/houseboat hire. More info: www.corroboreeparktavern.com.au; (08) 8978 8920. Mary River Wilderness Retreat (formerly Mary River Park): River trip, meals, camping. More info: www.maryriverretreat.com.au; (08) 8978 8877. Shady Camp Campground: tents/camper trailers/vans, toilets only, boat hire and launching, no shade. More info: (08) 8978 8986. Point Stuart Wilderness Lodge: Meals, camping, wetlands cruise on Rockhole Billabong, boat hire at Shady Camp. More info: www.pointstuart.com.au, (08) 8978 8914. For something completely different, team up with a group of RVers and hire a houseboat for a night or two on Corroboree Billabong. More info: www.maryriverhouseboats.com.au, (08) 8978 8925. Other boats also available. Fishing, boating, house-boating, river and wetlands tours, bird and wildlife viewing, four-wheel-driving. Boat launching on the west side of the Mary River highway crossing, Corroboree Billabong, Rockhole and Shady Camp. Wetland Cruises: www.wetlandcruises.com.au, (08) 8985 5855. Wildlands Wetland Safari: www.wildlands.com.au, 0448 967 734. Mary River Wetlands Cruise: www.pointstuart.com.au, (08) 8978 8914. This is estuarine crocodile territory so be croc wise at all times. Be wallaby aware at all times, especially between dusk and dawn. Please slow down to avoid hitting one of these wonderful animals.